Ansal Group being a pioneer in the concept of high-rise commercial complex in Delhi started its operations way back in 1967. Since then Ansal Buildwell Ltd, has turned its dreams into reality by changing the developments not only in National Capital but also in major states of India and even abroad. Being into industry for more than 4 decades, Ansal has always foster excellence to meet people’s expectation through its enthusiastic management and dedicated team of professionals. Today Ansal has solidified itself as a 360° solutions provider in the field of real estate and construction. A trusted brand in real estate, Ansal Buildwell Limited is capitalising on emerging market opportunities to deliver high-end facilities and projects to its wide base of customers by constantly upgrading its internal skills and resource capabilities. The business line involves a wide range of products including Condominiums, Duplexes, Villas, Row Houses and Apartments of varying sizes, to give you a lifestyle that is affordable and adorable. With our upcoming township "Ansal Basera City" nothing can be more pleasing than a plush residence nestling amidst a tranquil green ambience, where every day at sunrise, you wake up to the chirping of birds unfolding from the womb of nature. Take a walk, exercise in the Gym, watch your children play in the parks, beat the summer heat with a dip in the pool, shop, eat and live a content life. Taking the mental make-up of a nature lover, Ansal Basera City has been conceptualised and designed as per the needs and lifestyle of the next generation. It is for people who can't stand to be in a room without a window. It is for those who take solace in the songs of birds and the whistling of dry leaves. Adding value to a world class living, the plots and luxurious villas are flavoured with opulent toppings and contemporary designer touches. Belatedly though, Jhansi has got a residential complex so much more elite and ofcourse natural, than the rest. Located at the main Kanpur By-Pass, 7km from Railway Station on the highway to Kanpur, Ansal Basera City is going to be one of the most sought after addresses across nearly 800 sq. km on this eminent North-South & East-West corridor junction of India. Bringing tomorrow's lifestyle today to Jhansi, is the sole objective of Ansal Basera City. 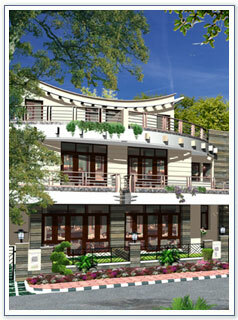 That is why every Plot and Villa has been designed with comfort and aesthetics that defy imagination. Well designed and manicured gardens for a fresher and greener life. Beautifully landscaped gardens, to make your evenings more beautiful and peaceful. The central park which shall be the spine of the township spread over 5 acres of plush green lounge and water features. A complete life, offered by Ansal Basera City takes care of all your needs and requirements.